Abingdon is a town of three rivers: the Thames, the Ock and the hidden Stert all flow through the town. The fine Thames Bridge was mostly built in 1927, but two medieval arches of 1416 remain. There are pleasant walks along the Ock and the tow path of the Thames to Abingdon Lock and Abbey Meadow (in Oxfordshire) from where there are regular boat trips in the summer. A market town, though somewhat larger than most, Abingdon bosts a town hall to rival all others. Standing in the Market Square (market on Mondays), it was completed in 1682 by Christopher Kempster, Sir Christopher Wren's master-mason who created the dome of St. Paul's Cathedral (London). It is a superb piece of monumental restoration architecture, yet still retains the open ground floor of earlier years. The interior houses the town museum with many interesting local exhibits (the tourist information centre is in nearby Bridge Street). It is from the beautiful balustrading and cupola on the roof that town officials ceremonially throw buns to awaiting crowds below on suitable National celebratory (often Royal) occasions. More regular are the (Mock) Mayor of Ock Street elections every June when the local Morris Dancers choose their leader. 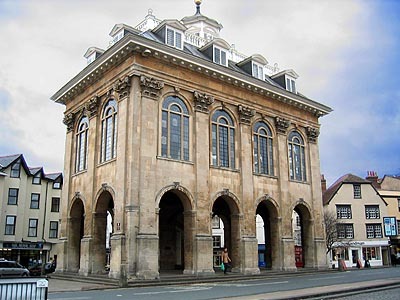 Abingdon is one of fifty towns in the country listed for their special architectural merit. The town has some thirty-four 17th century buildings and twenty-two that are even older. However, this has not prevented it growing into a thriving centre with good High Street name shopping throughout the main streets and modern shopping mall. There is also an excellent Sports and Leisure Centre housed in the cleverly converted Old Gaol which looms menacingly over the Thames. It is said locally to be haunted. The town is florally bedecked in Summer and there are two large public parks: the Albert Park and the Abbey Gardens. The latter are laid out over the buried remains of the historic Abbey of Abingdon founded way back in AD 675. Dissolved at the Dissolution of the Monasteries in 1538, there is nothing of the church left to see today, though there are some fascinating associated buildings. The mock-ruins in the gardens are, unfortunately, only an imaginative 1920s rebuilding from various pieces of the abbey and other churches. It is known as 'Trendell's Folly'. Nearby is the 13th century Abbey Exchequer, with its unusual roofed chimney. The Checker Hall adjoining was restored, in 1953, as the Unicorn Theatre. Its Elizabethan style stage and excellent acoustics provide a unique atmosphere. The beautiful timber-framed Long Gallery dates from the late 15th century and was probably used for guest accommodation. Today it is available for hire for various functions and is opened to the public on a regular basis by the Friends of Abingdon. Their headquarters is in the old Abbey Bakehouse. 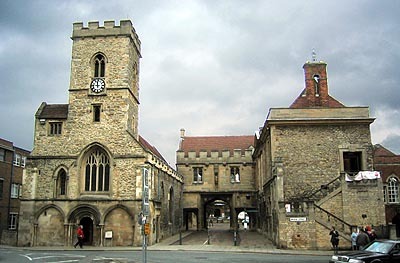 The Abbey Gateway stands between the gardens and the Market Square and dates from 1450. It is sandwiched between the hospitium of St. John (1130, though much extended in the 18th century) and St. Nicholas' Church (1184). The latter was the burial place of the mother of St. Edmund of Abingdon, a 13th century Archbishop of Canterbury. East St. Helen's Street is probably the most charming in Abingdon where ancient houses and Ipswich windows lead down to St. Helen's Church. This is said to be the widest church in England and its fine 13th century spire is well known to many river cruisers. Inside are gems such as the mayoral pew, some good brasses and an extraordinary colourfully painted ceiling of 1390 featuring kings, saints and prophets. St. Helen's Churchyard is remarkable for its triple set of magnificent almshouses: Christ's Hospital (or Long Alley) (1446), Twitty's (1707) and Brick Alley (1718). The former are absolutely delighful with their cloistered walk of 1605 and lantern of 1707.